The Digital Schools of Distinction Award is a flagship programme to promote and acknowledge best practice and use of ICT to deliver the best educational experience for pupils at primary level. 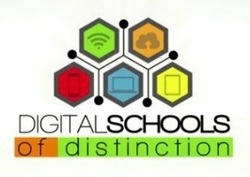 St. Cronan's Senior School are registered under the Digital Schools of Distinction Award programme. Over the last decade, St. Cronan's Senior School have adopted and excelled in the use of ICT. Our computer room is equipped with 30 pc's. Each classroom is equipped with a laptop, interactive whiteboard, visualiser and classroom computer. Our school is fully networked with a server. We use Junior Librarian in our library, which recognizes any book we have scanned in, immediately displaying the cover, author, publisher, category etc. The children have access to digital cameras, scanners, printers, interactive whiteboards, internet, educational software and other aspects of technology as part of their day. Our S.E.N. team use diagnostic software to assess literacy in addition to educational software for children with special educational needs. We use databiz for attendance, reports and standardised testing results. "Text-a-Parent" is also used to communicate with parents when required. Our new website will be launched on the 14th of February, 2014.